ADD THIS MASTERPIECE TO YOUR MICHAEL JACKSON COLLECTON NOW!! 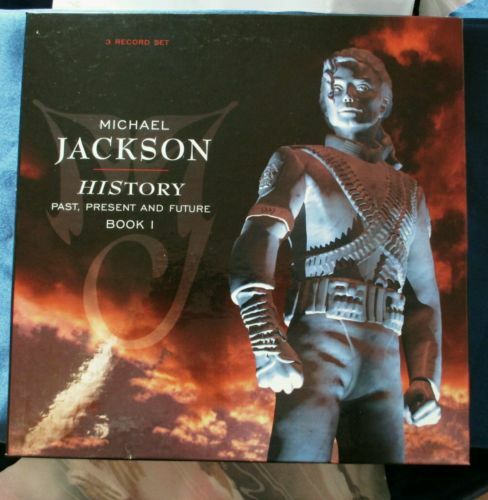 HIStory: Past, Present and Future, Book I is the ninth studio album by American recording artist Michael Jackson. HIStory comes with a 52-page booklet with liner notes by Janet Jackson, Steven Spielberg, Jacqueline Kennedy Onassis and Elizabeth Taylor, as well as many never-before-seen photograps. Shiny Vinyl never played condition! Box in very good condition some corner wear. Small tear on one sleeve. Please Check pictures for condition. Original owner. From a pet free smoke free, controlled climate environment. You will receive this exact item, as shown. Comes in a protective sleeve. We always make sure to pack all are vinyl record albums with extra care in professional packages specially designed for 12" records. PLEASE REVIEW MY FEEDBACK AND BUY WITH CONFIDENCE. WE OFFER COMBINED SHIPPING FOR ADDED SAVINGS! the descriptions provided are solely my opinion and to be used only as a guide please see photos for best description. items are inspected and photographed to the best of my ability and descriptions provided are to be used solely as a guide. I make no guarantees or warranties for items purchased, nor am i responsible for any manufacturer defects evident or not evident at the time of an item's inspection. should you have an unforeseen issue with any item purchased simply contact me before leaving negative feedback and we can resolve the issue. International Buyers – Please Note: Import duties, taxes, and charges are not included in the item price or shipping cost. These charges are the buyer's responsibility. Please check with your country's customs office to determine what these additional costs will be prior to bidding or buying. Customs fees are normally charged by the shipping company or collected when you pick the item up. These fees are not additional shipping charges. We won't under-value merchandise or mark the item as a gift on customs forms. Doing that is against U.S. and international laws. We reserve the right to determine the number of items that will be combined in one package. This will be determined by the size and weight of the items. International shipments will not exceed $500 per package due to insurance limitations. The safety of your purchase is and always will be our #1 priority. Thank you for stopping by don't forget to check out my other items for sale.